I've arrived in New York for a buying trip (which will also include West Palm Beach) and I'll be filling a container with one-off treasures. While here I'm staying at the Gramercy Park Hotel and with the wonderful Michelle Adams of Lonny mag. 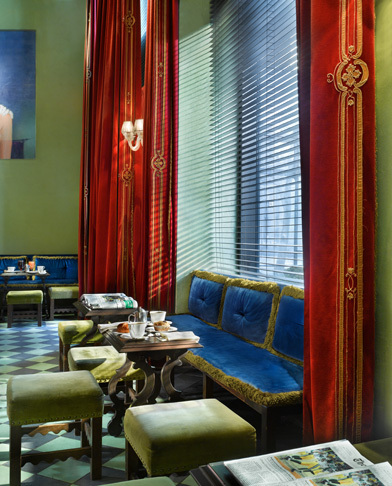 The Gramercy Park Hotel is, in a word, spectacular - Bohemian beauty in a truly contemporary context - and a far cry from the neutral tones you find in most luxury hotels. The GPH also has the most incredible collection of art, with works from Andy Warhol, Damien Hirst and George Condo to name just a few. You can view them here at www.artgph.com. Just had breakfast and coffee in Gramercy Park, a private garden that's accessible only by key (the hotel lent me theirs!). Serene, sunny and sublimely quiet, the park is the perfect place to kick back with an almond croissant, an espresso and a copy of the Times. 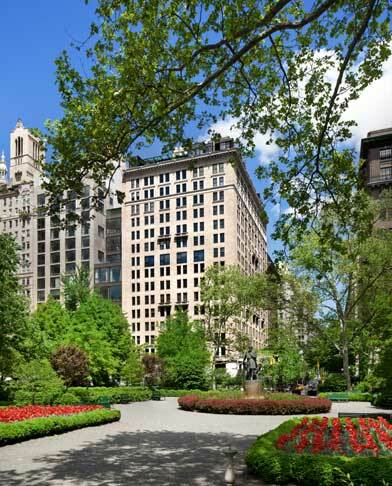 Gramercy Park was created by visionary developer Samuel Ruggles, who wanted to create an oasis amid the hustle and bustle of the city. A walk along its paths reveals some of NYC's architectural gems, including The Player's Club, the Gothic revival National Arts Club, the Stuyvesant Fish House and 36 Gramercy Park East, a stunning neo-Gothic structure.